Microwaves101 | Loss or gain? On this page we hope to put a small issue to bed, or at least down for a long nap. We'll present our point of view, and an opposing point of view. Feel free to enter into this discussion yourself! On the Microwaves101 website, we have defined (in several places) that return, transmission and insertion losses when expressed in dB are positive numbers for passive networks. When you measure a cable on a network analyzer, you will observe that the test equipment gives you numbers for S11dB and S21dB that are negative. What gives? Before we answer this question, let's say it ranks up there with flag burning as a worthy topic in a presidential election. There are two sides to the topic, with people lined up on both sides to say that the others are crazy, while the world goes to hell in a handbasket. The total carbon footprint of all of flags burned by demonstrators in a year doesn't equal the tailpipe emissions of one SUV for a week, let alone a dopey NASCAR race. Nor does a seemingly missing minus sign really matter that much, especially if it isn't really missing the way you've defined it. This effectively means that for passive devices, return loss expressed in dB is a positive number, because the reflection coefficient is less than unity. Similarly, for transmission loss or insertion loss, the value in dB would be positive for passive devices because the transmission coefficient is less than unity. In a specification, if you want a really good cable, you should ask for a minimum of 20 dB return loss and a maximum of 1 dB loss for example. For active devices, a negative return loss in dB is possible, but this indicates an unstable situation. For active devices, we usually don't refer to loss, we talk about gain in decibels, which would be positive if the transmission coefficient is greater than unity (outside the Smith chart) or negative where the gain has rolled off to less than unity. When you look over the infinite frequency band, amplifiers don't always have gain, they have loss! Here's the way we look at it. If you are expressing the magnitude of a reflection coefficient in dB, don't reverse the minus sign. The reflection and transmission coefficients (and S-parameters in general) are measures of Vout/Vin, so you can think of them as "gain" and not "loss". Loss is expressed in the opposite sense, as Vin/Vout, hence the minus sign if you are converting reflection or transmission coefficients, after all, log (1/X)=-log(X). Here's another way to look at it: if you lost $5000 in the stock market because your company is tanking while we have this discussion, you wouldn't say "I lost negative five thousand dollars in the stock market", because you lost a positive amount of cash. You might say "I gained negative five thousand dollars" and be correct, but this might be indicative of why you never get a second date after your friends fix you up. Why then, does all that automated measuring equipment express S-parameter magnitudes of passive networks with minus signs? When you are measuring S-parameters and you observe minus signs on all of the S-parameter magnitudes when they are expressed in dB, you are looking at reflection and transmission coefficients, not return loss and transmission loss. We totally agree with the equipment, S11 and S21 will always be negative for a cable or a test fixture. But when you convert the data to "loss", drop off the minus sign. Justin is a reader who took the time to write us and express his point of view which is in line with the EIA standard. Thanks! EIA-364-108 provides a definition of return loss, which we reprint below. The EIA keeps their documents hidden on their web site and warns you not to not to violate the law by reproducing the document without permission. Now we live in fear that we'll be hearing from EIA lawyers for snipping out paragraph 1.3.5 from a download we obtained from one of their affiliate web sites. Justin points out a common problem with specifications that define minimum or maximum performance parameters. A person can correctly state "19 dB of loss" or "-19 dB", but "loss" must be substituted for the for the minus sign. The reason the negative sign has been removed, ironically, is to reduce confusion. In turn, it has only created additional confusion. As we know. 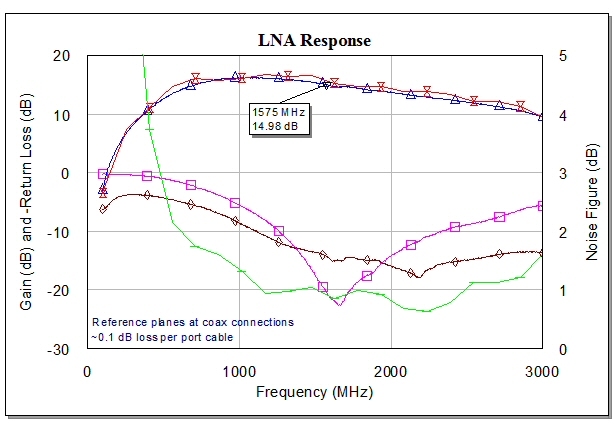 For example, if the RL spec is -19 dB MIN, does -18 dB pass or fail? It fails (-18 being greater than -19). Expressing all RL numbers informally as positive numbers can reduce the confusion associated with Max and Min designations. -Amplifiers, considered active devices, have gain (after all they amplify the signal). Gain is always expressed as positive dBs. -Cables, considered passive devices, will always have loss (after all they are lossy). Insertion Loss (attenuation) is always expressed as negative dBs. "VSWR is a measure of the amount of signal that is reflected back from a connector. It is a vector quantity in that it has both amplitude and a phase component." This information, from Amphenol of all manufacturers, is incorrect. Your website correctly states it is scalar. Even if we haven't come to an agreement, hopefully this discussion has improved the understanding of this topic! ...here is how I address the problem (see attached graph). Notice I label the left axis "-Return Loss". The "-" is the design review smack-down; pardon my wrestling terminology. Normally it's not even noticed, but if someone complains about return loss being negative, I smack them down with "-".